Three popular primary education databases (Primary Search®, Middle Search® Plusand Book Collection: Nonfiction™) can be accessed via Searchasaurus®, EBSCO Publishing’s user search experience for users in primary education. Searchasaurusis an exciting and easy way for young researchers to experience online searching. 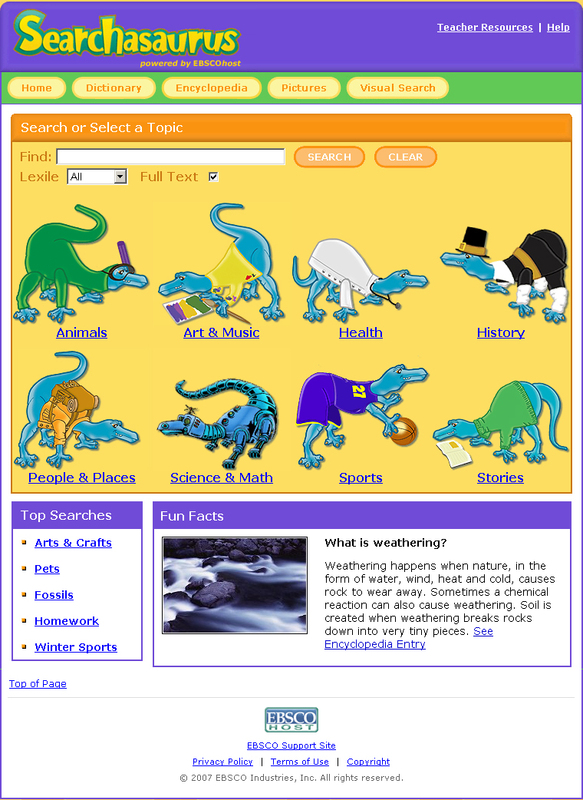 It is an animated interface with a dinosaur theme that encourages students to enhance and develop basic search methodologies. Students will be riveted by the colorful, animated interface, complete with erupting volcanoes and a dinosaur guide, as they gather information on a wide range of topics. Searchasaurus offers Lexile limiters (reading level), making it easy for students to read and research only appropriately challenging materials.